Harp is well known for its therapeutic, relaxing and healing affect. When combined with yoga the effect is nourishing and luxurious experience. 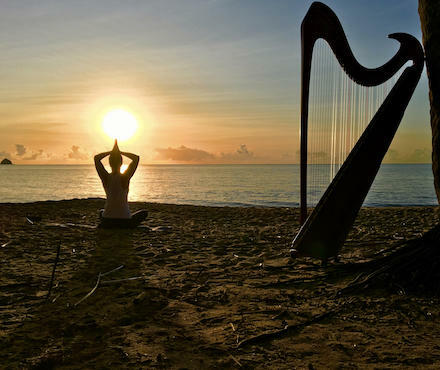 Harp and Yoga is beautiful. The sound of the harp has the effect of making the yoga and mediations go easier, softening the mind and body. Following movement and breath, the harp music maintains an aesthetic and peaceful environment. Once prana is flowing and particpants are centred in their body, there is an energy which flows through the room, and the music flows in it.